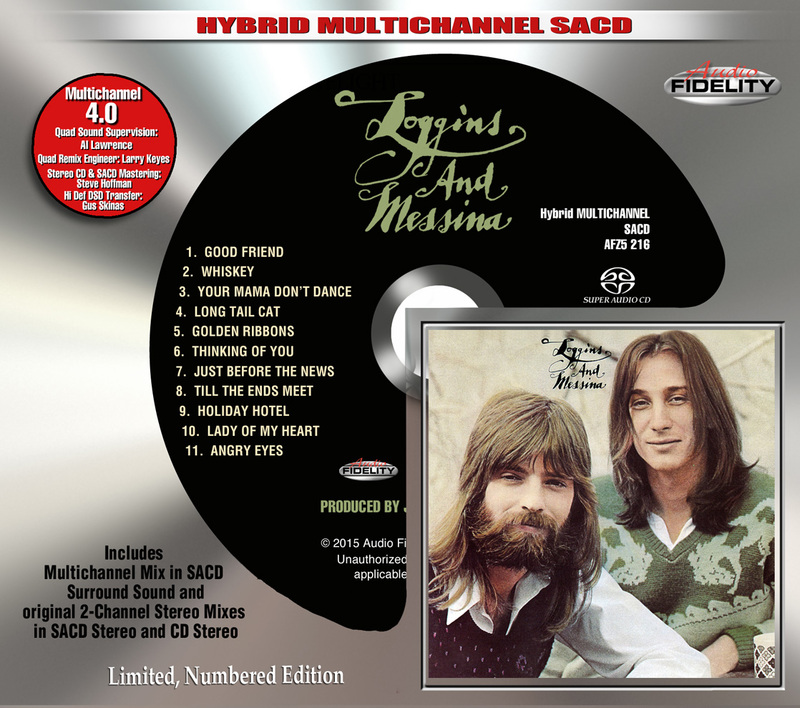 Camarillo, CA – Marshall Blonstein’s Audio Fidelity is releasing Loggins and Messina’s critically acclaimed self-titled album on 4.0 Quad SACD. While Loggins and Messina created many fine albums this one stands out as most representative of their impact. In the early ’70s the duo pioneered true country/rock and showcased it with style and near-flawless performances. The eponymously titled 1972 Loggins and Messina album built on the strengths of their debut outing, “Sittin’ In.” The same mix of short catchy country-folk-pop gems with longer intricately layered and meaningful ballads bordering on jazz and edgy rock powered its success. The album reached #16 on the Billboard charts and “Your Mama Don’t Dance” charted at #4. The epic “Angry Eyes” became an instant FM radio staple reaching the top of the college radio and AOR charts. This Loggins and Messina album has many varied textures and arrangements. A little bit of country, a number of quality ballads and some good old rock ‘n’ roll. Their backup band was anchored by multi-instrumentalist Al Garth, and also featured keyboardist Michael Omartian and Poco steel guitarist Rusty Young.